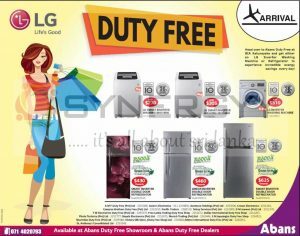 Head over to Abans Duty Free at BIA Katunayake and get either an LG Inverter Washing Machine or Refrigerator to experience incredible energy savings every day! 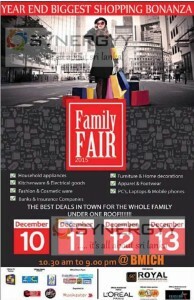 Damro Announces seasonal discount of 15% off on appliances of TV, Rice Cooker, lElectric Kettle Sandwich maker, Irons. 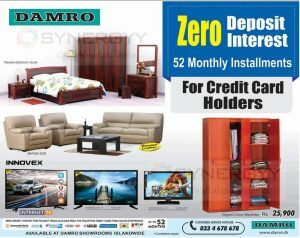 Damro, leading Home appliances, Furniture and Fitting seller in Sri Lanka announces a special 52 month installment scheme available for leading credit cards. Abans announces a special 20 months 0% interest Installment scheme for Nations Trust American Express Credit Cards. 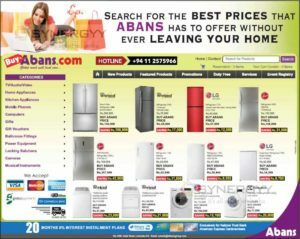 The offers are valid for range of products including TV, Audio, Video, Home Appliances, Kitchen Appliances, Mobile Phones, Computers Gifts, Gift Vouchers, Bathroom Fittings, Power Equipment, Locking Solutions, Cameras and Musical Instruments. 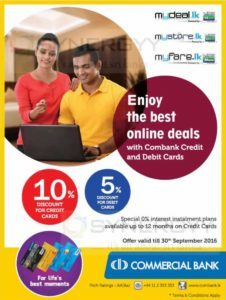 Commercial Bank announces a special promotion of 10% off on mydeal, mystore and myfare website sale. 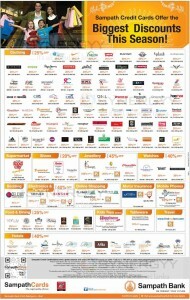 This special promotions brings you more discounts than; what mydeal offers you. 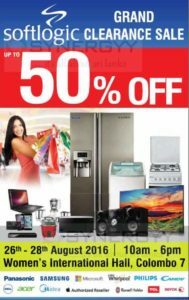 Softlogic announces their Softlogic Grand Clearance sale starts today at Women’s International Hall, Colombo 7 till 26th to 28th August 2016 from 10am-6pm. Visit today and grasp special discounts upto 50% from the leading branded home appliances, electronics and gifts. 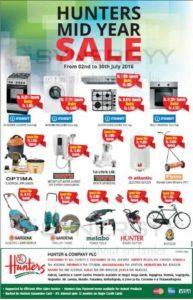 Hunter announces its midyear sale from 2nd to 30th July 2016 for the range of home appliances and electronics. 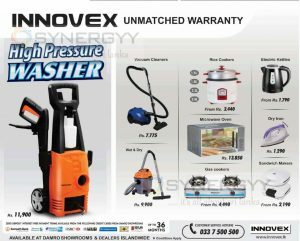 Enjoy unmatched prices for range of products including 4 Burner cookers, Washing Machine, Cooker Hoods and Hobs, Built in Oven, Electrical Appliances, Instant Hot Water shower, Mixer Grinders, Electric Geyzer, Manual Lawn Mowers, Electric Lawn Mower, Trolley/Hose, Power Tools, Brush Cutter and Bicycles. 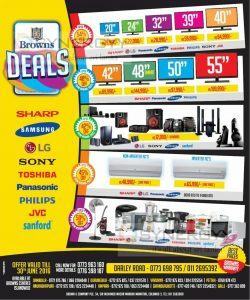 Browns announces a special discounts upto 54% on Home appliances and Electronics for the range of branded products such as Sharp, Samsung, LG, Sony, Toshiba, Panasonic, Philips, JVC and Sanford till 30th June 2016. The offer valid for Television, Monitors, Hi-fi and audio systems, Air-conditioner and Home appliance electronics. Commercial Bank and Softlogic announces a special promotion of discount upto 50% off for Commercial bank credit card and 35% off Commercial Bank Debit cards. 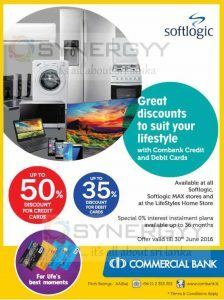 These great discounts are available at all Softlogic, Softlogic MAX stores and at the Lifestyles Home Store. And Special 0% interest installment plans available up to 36 months. 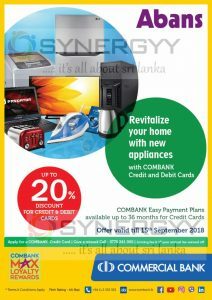 Damro Innovex announces a special promotion for their Innovex Home Appliances at a affordable price to Sri lankan market. 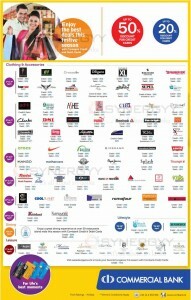 Enjoy special price along with 36 Month interest free payment schemes for selected credit cards. 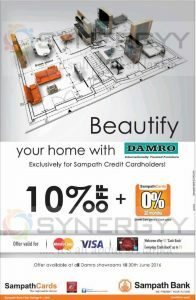 Sampath Bank and Damro announces a special offer for enjoy 10% saving at Damro when you use Sampath bank credit card on your purchases till 30th June 2016. 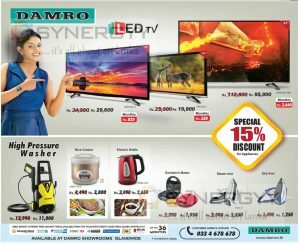 Damro is leading Furniture and fitting and home appliance seller based in Sri Lanka with largest number of outlets Island wide offers a lowest price to customer as possible. Damro joint hand with Sampath Bank Credit card and offers you 10% saving on your purchases made in the month of June 2016. 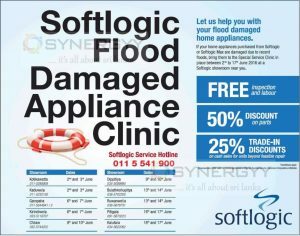 Softlogic extended their helping hand beyond business perspective, if your home appliance purchases from Softlogic or Softlogic Max are damaged due to recent floods; bring those to the special service clinic in place between 2nd to 17th June 2016 at a softlogic showroom near you. Softlogic offers your free inspection and labour on your damaged home appliances and if it is needed to replace any parts Softlogic will offer you 50% off on the price parts. In worse case; if the home appliance is beyond feasible repair you could trade in discount at 25% on cash sales. Commercial Bank announces a special Promotion for their Credit Card and Debit Card Holders an excellent discount from the leading merchant around the island. Visit your nearest showroom and do your shopping with your commercial bank Credit or Debit card and enjoy discounts upto 50% on this Sinhala / Hindu New Year Festive. Sampath Bank announces a range of promotions for the Sampath Bank Credit cards for Clothing, Super markets, Shoes, Jewellery, Watches, Beddings, Electronics & Furniture, Online Shopping, Motor Insurance, Mobile Phones, Food & Dining, Kids toys, Tableware, Travel and Hotels for this Sinhala & Tamil New Year festive of Avuruthu Festival. Seylan Bank, one of the leading commercial bank in Sri Lanka announces range of the discounts and promotions for their Creditcard holders. Happiness for the ones you love, resides in your hands. It never fades, it only grows – show them you care as you reignite the romance this Valentines with Seylan Cards. Hunters announces a special promotion for the Indesit branded Electronics and home appliances, buy any of Indesit branded Electronics / Home appliances from Hunters outlet and enjoy a discounted price and special gift until the stock last. Are you aware the Beko is a leading Spain branded home appliances and electronics; well known for the performance and durability of service. World class Beko branded home appliances are now available in Sri lanka at Singer Mega, Singer Plus and Sisil world showroom. Whenever you purchase a beko branded home appliances or electronics in this season of 15th February 2016; you will got a chance to visit Spain and cheer team Barcelona in a live game. This opportunity only available for lucky 3 winners of those who own any Beko branded home appliances and electronics in this season. 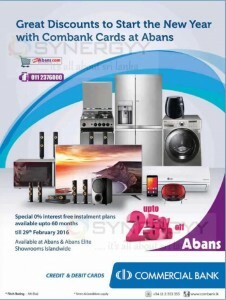 Great discounts to start the New Year with commercial bank credit or debit cards at Abans, Enjoy discount upto 25% on your electronics and home appliances shopping at Abans till 29th February 2016. Let’s celebrate the Christmas and New Year with much more comfortable than last year, here the most expected shopping bonanza again in colombo from 10th to 13th December 2015 at BMICH from 10.30 Am to 9.00 Pm. 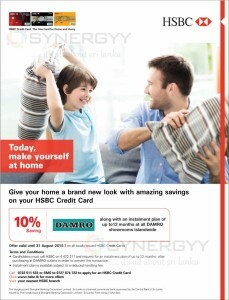 Give your home a brand new look with amazing savings on your HSBC Credit Card, enjoy 10% saving from Damro along with an instalment plan up to 12 months at all DAMRO showrooms islandwide. Asia Exhibition and convention organize Art of Living Exhibition @ BMICH from 17th to 19th July 2015. The exhibition brings all home-making Solutions from Foundation to Rooftop and Everything Else in Between. 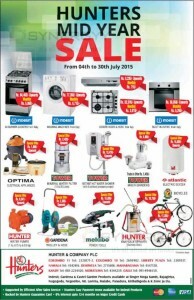 Hunters announced a Midyear sale from 4th July to 30th July 2015, visit to any of Hunters Showroom and purchases your home appliances and electronics at a special price. 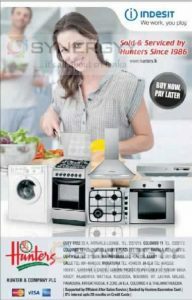 This mid year sale bring you many more products like 4 BURNER Cookers, cooker hoods and hobs, washing machine, built in ovens, Electronic Appliances, mineral water filter, Instant hot water shower, electric geyzer, mixer grinders, Bicycles, water pumps, Trolly &Hose, Power Tools, Knapsack Sprayer and many more… at a special price. don’t miss this chance. This robot vacuum cleaner that works on its own and it is the Innovative and Revolutionary Automated Cleaning device that Saves more time for you House-wives or Working ladies. Smart settings allow you to programme the HOM-BOT to clean from a certain time and stop… or keep cleaning…! Once the battery is low it will automatically recharge and start cleaning from where it last stopped -saving time.